This morning I woke up feeling a bit sick. My throat hurt and I felt tired and achy. I guess Matsuyama is one of the best places to get sick on the pilgrimage. At least in Matsuyama we are staying in a comfortable hotel with a great shower, and when we do walk around the temples of the city, we can do it without our backpacks. But I do not plan to get sick; I am sure that it is just a passing weakness. Breakfast at the hotel was a wonderful buffet. I made myself a large vegetable salad, miso soup, a small amount of tofu with ginger and soy, steamed rice with a local speciality topping of sesame cooked in soy milk, pickles, and seaweed. The hotel does not like you to wear the room slippers to the restaurant, so I was styling and profiling with my new Tabi white shoes. Most Japanese people giggle as they see me, a foreigner who wears laborer’s Tabi shoes for style. I think they look fabulous, and I need every break I can get from wearing my trail shoes. After breakfast we walked over to the nearby Starbucks and over Earl Grey tea with soy milk and honey, we looked at our route for the next few days. For today, we planned an easy day to allow me to recover. We decided to walk from our hotel to Temple 50 and on to Temple 51, and then continue walking north to Dogo Onsen, a well preserved hot spring Onsen that was originally built over 3000 years ago. The Onsen is a fun cable car ride from our hotel. Dogo Onsen is the oldest Onsen in Japan, and one of the most famous. It is open to the public for bathing and, thanks to its large and caring staff, it is in immaculate condition. It is built almost entirely of wood, with granite bathing areas. During our walk to Temple 50, the rainy morning turned into a sunny afternoon, and I regretted not bringing a hat. I was sweating, feeling feverish, but we walked on and got to Hantaji Temple on the eastern slopes of Matsuyama. A busload of Henros had just left the temple when we arrived. We had a quiet time to enjoy the grounds and pray. Hantaji is known as the Temple of Great Prosperity. At one point it was very large with dozens of buildings, but it was destroyed several times by fire and wars. 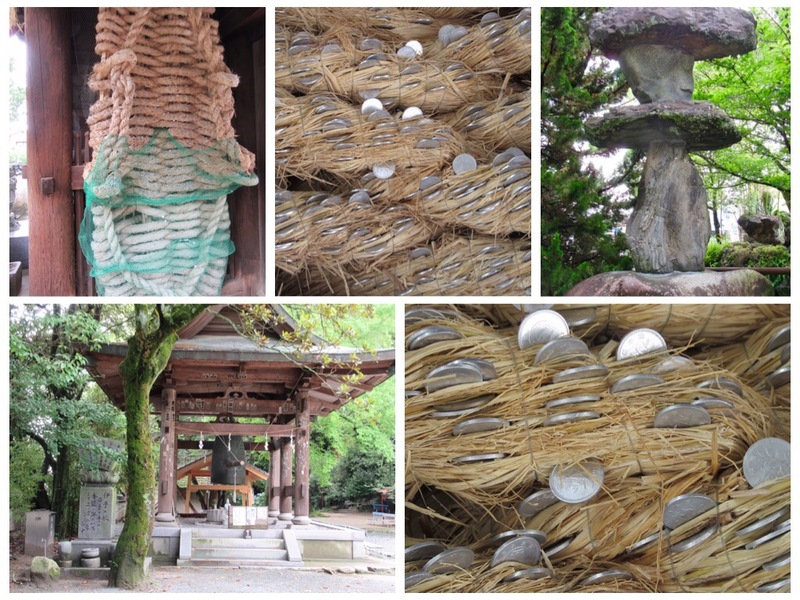 From there, we walked north to temple 51, Ishiteji –The temple of the Stone Hand. This temple has an interesting story on the pilgrimage. Emon Saburō was once the wealthiest man in Shikoku. He had eight healthy sons, and in ancient Japan, that meant that he was on his way to making a large clan. He was neither a generous nor a kind man. He believed in helping only those who were related to him. He refused to give alms to Kobo Daishi on his alms collection route. In fact, he actually chased Kobo Daishi in anger with a broom, when he came to his door. At another time, he got angry and struck Kobo Daishi’s begging bowl, which crashed to the ground and broke into eight pieces. Soon after, all eight of his sons died under mysterious circumstances. Emon Saburō realized that Kobo Daishi was not a beggar but a holy man, and he decided to change his ways and become more charitable. He started walking the pilgrimage in search of Kobo Daishi in order to ask for his forgiveness. He walked the pilgrimage for years, living the life of a mendicant pilgrim, but could not find Kobo Daishi. Finally in desperation, he started his pilgrimage counterclockwise, and ran into Kobo Daishi who gladly forgave him. But the hard years in the pilgrimage route, took their toll on Emon Saburo and he was on his death bed. Kobo Daishi took a small stone, wrote something on it and placed it in the hand of Emon Saburō. The dying man clutched the stone in rigor mortis and died. Many years later a baby was born to a wealthy ruler. The baby had his left hand clutched in a fist, and he never opened that hand. When the baby was three years young, the chief priest of Annyōji (the former name of Temple 51) was brought in and he succeeded in opening the child’s hand through prayer. When this child became an adult, he quickly regained his wealth and when he became the ruler of Yuzuki Castle, he renamed the temple Ishiteji – Stone Hand. Jules adds: “I so enjoy hearing the legends connected with each of the temples on the pilgrimage. Most of them involve people that Kobo Daishi encountered during his many years of wandering around Shikoku. There is currently a belief that there are certain times when it is auspicious to walk the pilgrimage counterclockwise – in fact, this year is one of those times. The temple was a delight to visit. It is a place to which people bring their newly born children to be blessed with a good life. We saw a family bring a tiny baby with his eyes barely able to open. Behind the Hondo (main hall) there is a long tunnel. The recent rainy days made the tunnel very moist with wet floors and dripping walls and ceiling. The tunnel was very dark and was lined with Jizo statues. At the end of the tunnel, there was a stone which was placed at the other opening, to block the view from the road. Walking through this dark and mysterious tunnel that was dripping wet, felt like an adventure, especially because we were the only ones on this journey of exploration. It felt like visiting a haunted house in an amusement park with deities all around us, that you could hardly see. There were also two side tunnels which were lined with paintings of Buddhist deities painted on metal, and hundreds of sculptures. I was in Heaven walking though the tunnels. This temple had many artistic figures carved in wood and wonderful wall paintings. One part of the garden was filled with stone carvings with intricate details. There is also a museum of artifacts with great painted scrolls and amazing masks, sculptures and antiques. I felt like a kid in wonderland, exploring all the nooks and crannies of the temple and its many delights. Luckily we were alone and avoided all the bus Henros who arrived after we had finished. At the entrance, vendors sold pounded Mochi cakes grilled on hot stones. We bought a few to try, and they turned out to be very tasty. They are sold in this temple since ancient times, although hundreds of years ago, they were given to walking pilgrims as gifts. From temple 51, we walked to Dogo Onsen. Without a doubt, it is the area in which most of the hotels in Matsuyama are located. The old Onsen building is very beautiful. It is run like a well-oiled machine with many employees, directing people, giving out Yukatas, serving tea and offering a guided tour of the Emperor’s private baths. We bought the Tama-No-Yu ticket, which is for the second floor baths, which only allow small groups of people at a time. You get about an hour and a half of bathing. They gave us towels, washcloths and Yukatas, and directed us to a tatami mat room which is the relaxation room. We put our shoes in the lockers, and our day bags in another locker, washed and bathed in the small hot spring baths and later put on our Yukatas and had tea and crackers in the relaxation room. In the women’s bath, I was with three other women. The second floor baths are fairly small for public baths, but very clean and enjoyable. Overall, it was an awesome experience and I loved it. It is amazing to see something that was established over 3000 years ago and is still carrying on such an amazing tradition. When we dressed to leave, we were given a tour of the private baths of the emperor. He only used it a couple of times in his life, so it’s condition was excellent. In 1956, they stopped feeding water into the emperor’s baths. The area surrounding the Onsen has some covered streets with shops selling sweets and souvenirs. In a beautiful store that specializes in Mikan Oranges, we had an amazing Mikan gelato. They had six different kinds of orange ice cream, each made from a different type of fresh orange. They also had peeled and dried oranges, without added sugar. We bought some bags of dried Mikan to snack on later in our pilgrimage. I was not in the mood for much dinner, so we decided to have an Okonomiyaki near our hotel. We found a small place run by a mother and daughter. The place looked like a bar, but the bar was a long hot stone on which they grilled the Okonomiyaki. We asked for a vegetable only Okonomiyaki and one with noodles on top, for Jules. It was a simple and tasty meal. It was also a place that caters to only a handful of locals who come repeatedly. Jules adds: “There was a great deal of bantering between the owners/cooks and the patrons. Evidently, the mother is quite a comedian, because she had everyone cracking up quite a few times. I think that the people come for the company and the entertainment as much as the food! Their grandson was also there, eating his dinner while playing games on his cell phone. Everybody waved goodbye as we left to go to our hotel. Tomorrow is another day and I hope that I will feel better. Starbucks – The temple of good coffee, comfortable seating and Lavender Earl Grey tea.